MSDEER.net • View topic - Crawfishing time! I usually catch mine especially when the price is high. I usually use deep water nets but decided to make some traps. It was time and labor some but got 35 built and put them out yesterday. Went and ran them today on a short soak and caught enough for a little boil. That would be high dollar bait. Those are the ones we always threw back. When I was growing up we always carried a seine and hit the ditches on the way to run our trot lines. If they were big enough to boil they were thrown back, along with the snakes and frogs. And yes, they are great bait for catfish. I admire your willingness to get out and catch your own crawfish. Most people now, including me, are too lazy to go out and catch their own. Yep those looked mighty tasty! What spice mix did you use? Love your pool setting! Thanks everyone. 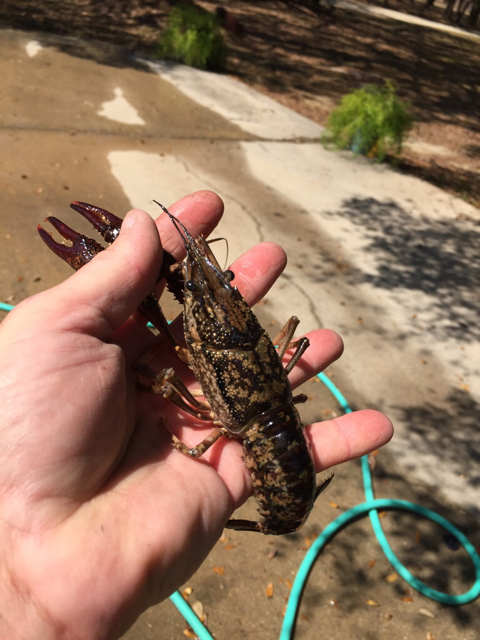 And no crawfish in the pool, currently I rank last in the house after the animals so I don't need the help haha. I went again today and caught around 50#, it's still kind of early but if our water stays up I will have a good season catching my own bugs from the gear I made, all together makes for good memories and good eating. nice I just ate some...u use beefmelt for bait? saddaddykiller wrote: nice I just ate some...u use beefmelt for bait? I use melt w nets but pogies w traps. Made a move today. Brought my pirogue so I can be more mobile. Should do much better tomorrow. I caught just over a sack today. Lol I don't do fakebook, it's the debil! My wife does with both of us on it but I don't partake. triple_duece wrote: My wife does with both of us on it but I don't partake. Wish I good do that. I paid $ 17.99 a pound for Louisiana crawfish tails, the other day, to make a casserole.